Mylo Xyloto knocked Noel Gallagher's High Flying Birds off the top of the album chart, but single Paradise couldn't break into the top ten singles in the Official Charts. Three new entries in the top ten singles kept Chris Martin and his band down to 14th, as Professor Green claimed the top spot with Read All About It featuring Emeli Sande. Labrinth, Simon Cowell's latest protege, went straight in at two with Earthquake, featuring Tinah Tempah. 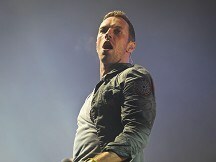 Coldplay's other new entry, Princess of China featuring Rihanna, could only break into the charts at number 33. Meanwhile, Michael Buble showed that the early bird catches the worm as his Christmas long player was new at number three in the album charts. Singer-songwriter Tom Waits broke into the top ten with his new album Bad As Me, just edging out Soldiers with Message to You. French dance duo Justice meanwhile came in at 35 in the album charts with Audio Video Disco.